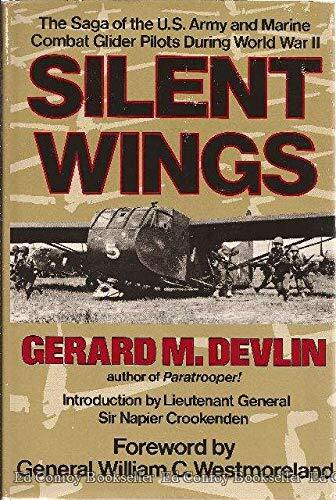 Silent Wings: The Saga of the U.S. Army and Marine Combat Glider Pilots During World War II by Devlin, Gerard M.: St Martins Pr, Gordonsville, Virginia, U.S.A. 9780312724603 I, First Edition., Signed by Author(s) - Vagabond Books, A.B.A.A. An impressive achievement in research and narrative skill, this is a comprehensive history of the U.S. WW II glider warfare in the Mediterranean theater, Europe, Burma and the Pacific. The men who flew these flimsy crates risked their lives by virtually crash-landing their heavily laden craft behind enemy lines, often doubling as infantrymen on landing. The missions were dangerous, and the volume is filled with tense survival and rescue stories as well as descriptions of large-scale disasters. Devlin (Paratrooper) works into the engrossing drama much information about the technical evolution of glider aeronautics and tactical problems, as well as quality-control snags with various defense contractors. The book includes more than 100 photos of glider pilots, their craft (plus British, German and Japanese gliders) and rare wartime scenes. An unusual World War II history about unsung heroes. Military Book Club selection. November 19<br />Copyright 1985 Reed Business Information, Inc.